Whether you’re looking for plastic kids cups with disposable lids, or you're in need of cups with reusable lids, we’re sure to have an option to suit your serving needs. You can also choose from various straw types, including curly and traditional. 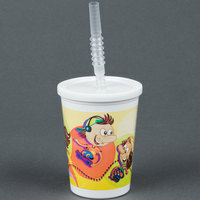 By having these kids cups with lids and straws to offer families with young children, you’ll be able to market your venue as a family-friendly establishment. Also make sure to check out other great items from Dart Solo and Huhtamaki Chinet. 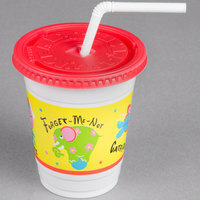 Hold any cold beverage in these plastic kids cups, including milk, juice, water, and milkshakes! 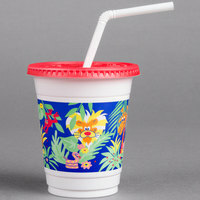 Since younger children can’t usually finish their entire meal in one sitting, these cups will allow them to take their drinks with them on-the-go. You’ll even find select reusable styles that are dishwasher safe for quick and easy cleanup. For more kid-friendly products for your establishment, check out our kids placemats, restaurant crayons, and booster seats! 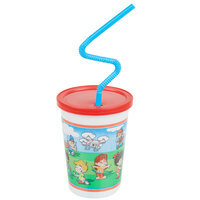 If you're wondering where to buy plastic kids cups, we have a large selection of plastic kids cups for sale at the lowest prices.